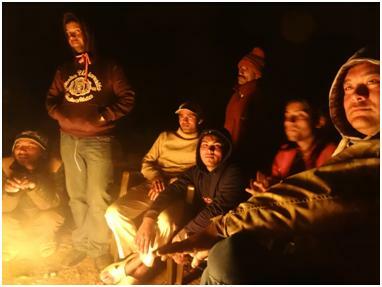 We spend most nights, gathered round the fire for warmth and light, under crisp Himalayan stars. The crowd changes nightly, the occasional trekker, villagers from the surrounding area, once a politician on tour or just the jeep drivers Santosh and Ram. So mostly its a case of in bed quite soon after the sun sets. The nights are crystal clear and cold. Easy to spot Venus. On the opposite sides of the mountain across the deep valley the sounds travel and some nights we can spot hunters on the opposite side of the valley, who use an occasional flash of torchlight. Not sure what they are hunting, I just get told wild animals and I am not sure if they are serious or pulling my leg again. A LOT gets lost in translation.